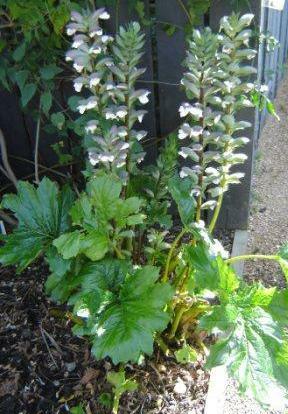 With handsome shiny leaves and bold flower spikes, these plants make a striking contribution to the electrical sub-station bed. 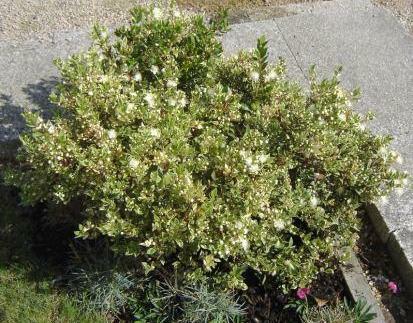 A small bush with cream/white variegation to its leaves and 1 inch wide saucer-shaped fragrant white flowers with a prominent boss of thin stamens and attractive variegated foliage. Growing in one corner of the square lawn. 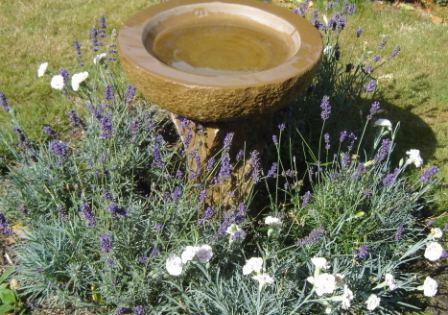 Dianthus and Lavandula nana atropurpurea "Hidcote"
A pretty combination around the bird bath feature which has proved very popular with our feathered visitors. In a small bed on the main lawn behind the yew hedge.